At SoundLife Hearing Technologies, we provide complete hearing tests. This includes air conduction testing, bone conduction testing, and speech testing. A thorough hearing test will take 30-45 minutes, depending on the patient. If you have already had your hearing tested elsewhere and want to discuss your options, we simply ask that you bring a copy of the test with you. The air conduction test is generally one of the first hearing tests a person will undergo for suspected hearing loss. 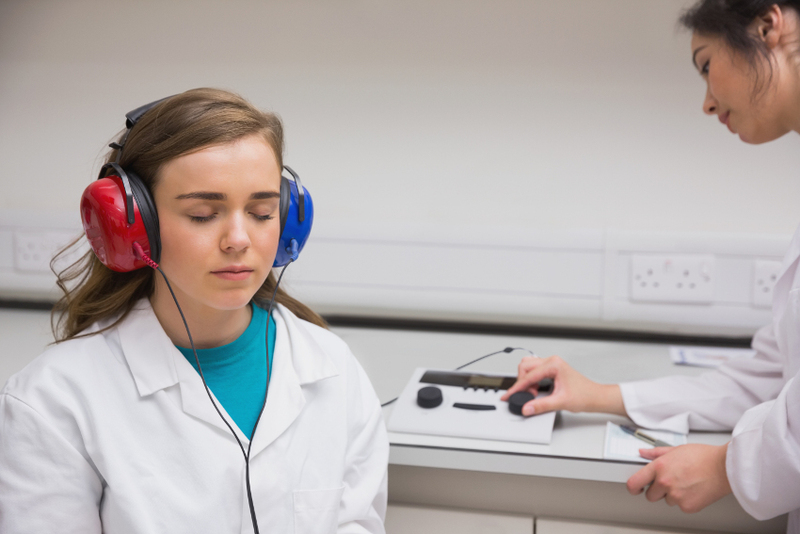 Also known as a pure tone test, this test allows the hearing health professional to find if someone is having trouble hearing sounds in a quiet and controlled environment. Generally, the patient will be asked to wear headphones or ear inserts and is presented with sounds in either or both ears. The patient will be asked to respond by raising a hand, pressing a button, or pointing to the ear that corresponds with the side in which they hear the sound. This will be repeated with different tones and levels of volume in order to find exactly which sounds the patient has trouble hearing. A bone conduction involves placing a vibrating probe or a bone oscillator against the mastoid bone behind the patient's ear. It helps to test how well sounds are transmitted through the bone. Again a series of tones will be presented to the patient at different volumes in each ear to determine if hearing loss has occurred. The sound is delivered to the inner ear through the bone mastoid, allowing the sound to bypass the outer and middle ear. This hearing test helps to measure how well your inner ear and hearing nerves are working. When tested in conjunction with the air conduction test, hearing loss can be attributed to a particular part of the ear. By isolating the location of the hearing loss it can be determined whether the loss is primarily sensorineural (permanent hearing loss caused by damage to the cochlea, hair cells, or auditory nerve) or conductive, or a combination of the two. This test is very similar to the air conduction test, but instead of using tones, spoken words are presented at different volumes. This hearing test allows the health professional to determine your speech reception threshold and your speech discrimination. Speech discrimination measures your ability to understand words when they are presented at a volume that is comfortable to you. This is crucial and patients who wait too long to seek treatment find to their regret that there is a "use it or lose it" aspect to hearing loss. The audiogram is a graph which gives a detailed description of your hearing ability in picture form. If you think you have experienced hearing loss, we would love the opportunity to find answers for you. If you have any questions or want to so set up an appointment for a hearing test, call SoundLife Hearing Technologies today at 417.753.2971 or email us at joesoundlife@gmail.com.